Within the Ring of Fire is a deep immersive Dark Fantasy roleplaying game designed to allow players to explore passions and politics as members of strongholds, ambitious mercantile guilds, rigid theocracies, blasphemous covens, exploratory expeditions, and more. The game’s mechanics are designed to produce a cinematic narrative style with fluid fast-paced play. 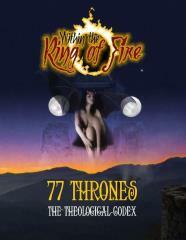 77 Thrones is a resource book for Within the Ring of Fire where fantasy and fiction dance with truth as the dogma, facts, and myths of the divine are revealed. Learn the names and secrets of those that sit upon the Thrones of Divinity. Witness the political games the Divine Courts play upon the stage of K’Vega-Thale as they via for control of existence. Learn their rules and serve them well.